What do Madera Canyon in Arizona and Michigan’s Upper Peninsula have in common? If you said they’re two of the best places in the United States to see a Berylline hummingbird, you’d be right, at least for this past September. 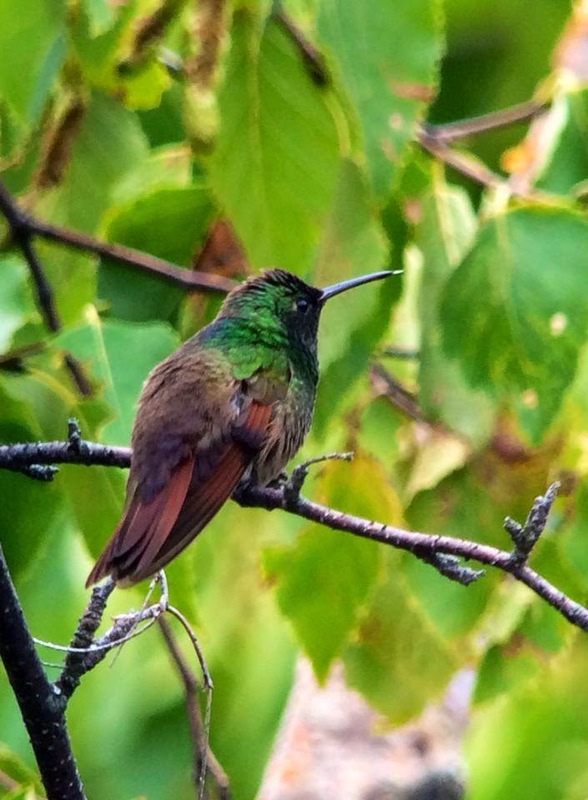 The rarest of the hummingbirds that regularly occurs in the U.S., Berylline Hummingbirds (Amazilia beryllina) are truly a tropical bird of Mexico and Central America. Their native range extends from northwestern Mexico through Honduras where they nest in the foothills of the Sierra Madre Occidental and some of the highlands farther south. Sightings of northern vagrants have been made north of Big Bend in Texas and the southwest corner of New Mexico. Recently, they’ve been known to breed in the southernmost sky islands of Arizona, a possible northward expansion of their range. Until last Wednesday, no Berryline Hummingbird had ever been seen north of the Chiricahua Mountains. The story unfolds like a suspense novel. On Wednesday evening, as birders across Michigan were settling in for a late summer’s nap, word came across the birding listservs of a possible Berylline hummingbird in Grand Marais, Michigan, on the edge of Pictured Rocks National Lakeshore. “Possible” was the key word in the report, and it’s used often when an ID is in question or a report is received second hand. The possibility of a Berylline anywhere in the Great Lakes, much less on the shore of Lake Superior, was beyond belief to many of us. A few conversations sprang up about what it possibly could be. A misidentified Ruby-throated, the common hummer around here? A Buff-bellied, which would be significantly more likely than a Berylline but still an astounding record for Michigan? I went to bed, six hours south of the beaches of Pictured Rocks, with visions of brilliant green hummingbirds in my head. Across town from me, Adam Byrne, who holds the record for most birds ever seen in Michigan (400) was in his car headed north. Dawn broke and turned into a lazy lunchtime as I took care of some chores and checked the listservs and Facebook frequently. There wasn’t a peep from the Upper Peninsula. That was odd. I knew many of Michigan’s best and most-connected birders were at the site of the bird at dawn, so why no report? In Grand Marais, the mood was somber. A dozen birders had been staked out where the bird had supposedly spent the previous day, but nothing was to be seen. Finally, in early afternoon, Skye broke the news that the bird was absent. It was what birders wistfully call a one-day-wonder. The consensus among everyone was that it would not be refound. Calls went out to birders still driving north that they might as well turn around. Caleb Putnam, Michigan’s Important Bird Area coordinator, and Rick Brigham, who is coming up on 300 birds in Michigan for the year, had just crossed into the U.P. Hearing the sad news about the hummingbird, they decided to ease their pain by birding the eastern U.P. for the afternoon. I expressed my condolences to the chasers and put the bird out of my mind. At 9:30 that night, I decided to turn in early. As I was setting the alarm on my phone, a message appeared from Adam Byrne. Adam launched right into the important questions. Adam had driven through the night to be at the bird’s location at dawn, not found the bird, and returned back home. Thirty minutes after setting foot in the door, he got the call from the local birder in the U.P. who had first broken the news. While the birders had been looking for the hummer at a rural house near the national lakeshore, it had spent the entire day at a house in town! The only reason any of this became known is thanks to the culture of Grand Marais and a lucky coincidence. For whatever reason, there are a lot of residents of the little town who are very interested in feeding hummingbirds. They aren’t necessarily birders, but they meticulously maintain hummingbird feeding stations and know their hummers. The resident of the home where the bird first appeared on Wednesday recognized it immediately as something unusual, even coming to the unlikely conclusion that it looked an awful like a Berylline. She snapped some excellent diagnostic photographs which led to the great chase on Thursday. Thursday evening, after having a bunch of birders staring at her house all day, she decided to go out to a local spot to watch the sunset, since she hadn’t done that in a while and summer was fading. A mile away, another couple from Grand Marais decided on a whim to check out the sunset. They ran into each other and started chatting since everyone in town knows each other. The first lady told the tale of the strange hummingbird the previous day and the even stranger birders camped out earlier that morning. The second lady thought that was fascinating since she had been seeing and photographing what looked like a Berylline hummingbird at her feeders all day. To catch up with the scene, we have birders that have driven from all over staking out a hummingbird that is actually leisurely lapping up nectar one mile away. 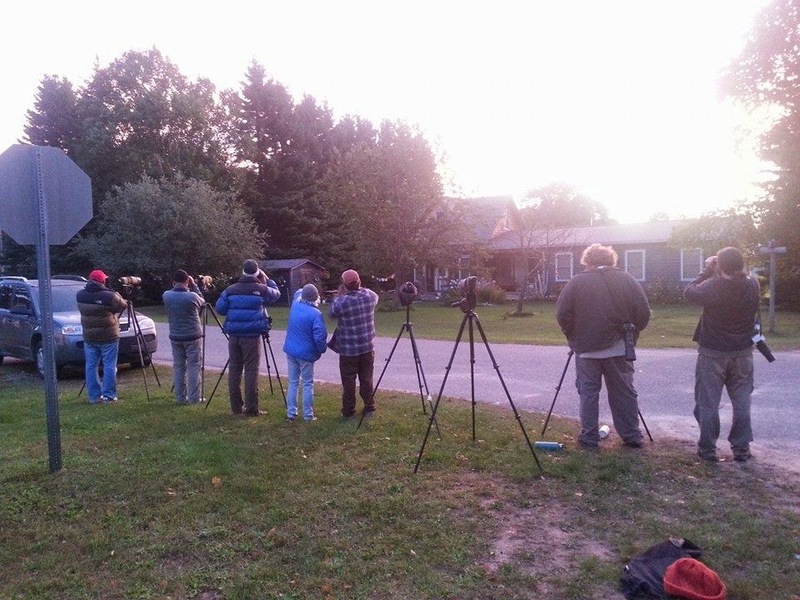 Some of these birders drove right past the house where the bird actually was to pick up snacks. Adam hadn’t slept in 36 hours and had just driven six hours back home, but he was about to head back north for Michigan bird #401. I was going to join him on the all-night drive for safety purposes. Caleb and Rick had just finished their consolation birding and were about to cross the Mackinac Bridge for home when the call came in that the bird was back. They diverted to a motel, thanking the birding gods for their decision to stay up north until the evening. The U.P. birders were comparatively well-rested and ready for another go at it at dawn. After an uneventful drive, Adam and I cut through a corner of Pictured Rocks to check out the previous day’s stakeout, then moved on to the new location just before dawn. In short order, other vehicles arrived and a bunch of bleary-eyed birders lined up across the street from a house in Grand Marais, summoned by the clarion call of a tiny green bird. Skye was there with a crew from the U.P. Caleb and Rick were lined up. I had my scope ready. Adam, running purely on adrenaline and caffeine now, was still standing. A park ranger from Pictured Rocks and a collection of others joined us. It wasn’t even light yet, when we spotted a dark hummingbird zip through the yard. Voices were hushed in anticipation. An odd chattering call came from a willow tree in the yard. None of the highly experienced Michigan birders assembled there recognized the sound, a very good sign that it was our tropical interloper. The assembled twitchers at dawn. And then a Cooper’s Hawk, notorious for feasting on small birds, flew over our heads and made several emphatic dives into the yard. Seconds after we had just admonished each other to remain quiet, everyone started yelling things like, “No!,” “Get out of here!,” and perhaps an obscenity or two. The hawk moved on and just as the true light of dawn emerged behind the house, the curtain was pulled to reveal our prize. 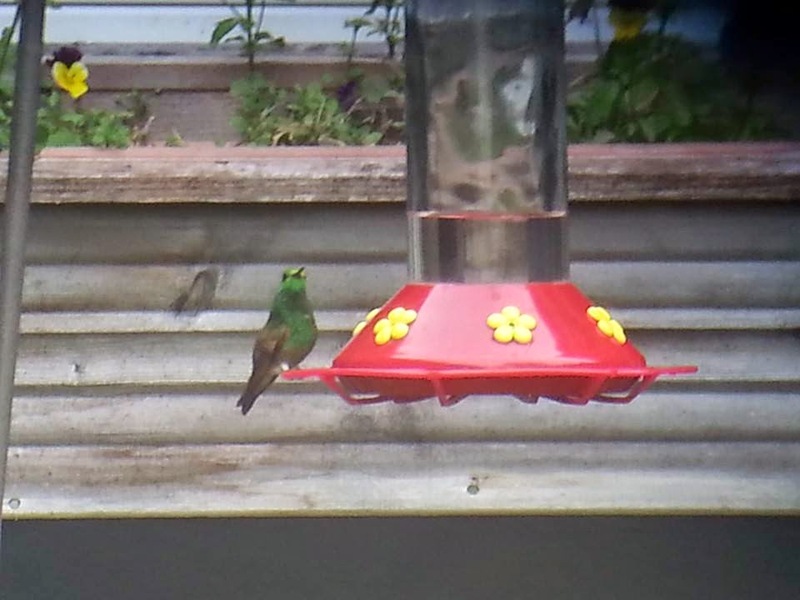 “Porch feeder!” We all got scopes and binoculars on the feeder, and there was a Berylline hummingbird happily sipping sugar water thousands of miles from the Sierra Madre. Hugs and high-fives were exchanged down the scope line. A tear or two may have even been shed. And then we watched the bird come and go for hours. Some of the best and most well-traveled birders of the region were standing there, and for all but two of us it was a life bird. The best picture I could muster, phonescoped. No one can say how the Berylline hummingbird got to Lake Superior. Some suggest Hurricane Odile pushed it out of its home and into the high prevailing winds that took it rapidly to Michigan. It’s anyone’s guess, and we’ll never know for sure. Sadly, it’s unlikely the bird will live to pass on the wanderlust in its genes. Hummingbirds can’t survive a northern Michigan winter, and the Berylline is a non-migratory bird by nature. Will it have the instinct to head south when it gets cold? In its native range it would be more likely to descend in elevation in response to poor conditions, which isn’t an option in Michigan. Stunning phonescoped capture of the hummer by Upper Peninsula birder Joe Kaplan. I’d like to think he’s just a wanderer like me who wanted to see what was out there beyond the oaks and pinyon pines of his home. Maybe he’ll head home to the Chiricahuas and tell tales of his adventure and the ruckus he caused among the silly humans out east. In the meantime, the intrepid birders of the Thursday and Friday chases are sleeping. That is crazy! What a fun chase!